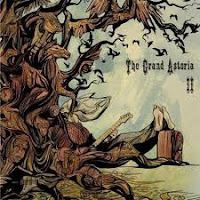 After reviewing The Divine Baze Orchestra, Sloath, and Barn Burner today I think that The Grand Astoria is a perfect blending of all of their styles. II contains slow doomy songs with no lyrics, ala Sloath, but with psychedelic grooves throughout, and less sludge/drone; more like The Divine Baze Orchestra. That was my thoughts on their first song, "Enjoy The View," and because of it, I thought the rest of the record was going to be another that treads the line between stoner and doom (not a bad thing! ), but I was surprised. Their second track, with it's ridiculously long title, "The Inner Galactic Experience Of Emily Dickinson And Sylvia Plath," is a straight-forward rocker, something that if you read my Barn Burner article, I like a lot. It's a stark change between songs, completely unexpected, but very welcome. The next couple seem to be a melding of the two previous ideas; "Visit Sri Lanka" is a short instrumental, and really psychedelic, which leads directly into another, longer and more rock-oriented instrumental, humorously named (after my other hobby) "Wikipedia Surfer." While the two flow into each other, the second is the better track, partialy because it is a little heavier, but it's length gives the track time to grow and evolve - something I like in my music. The last track, "Radio Friendly Fire," tends to head in the same direction as the first; it is a doomish psychedelic song, again instrumental, aside from some sound clips in the background. It strikes me odd why bands like this, Titan, and others would release an album that is all instrumental aside from one track. Why not just go full-instrumental? Or mix in more songs with vocals, so it's at least closer to a 50/50 split. The Grand Astoria's album doesn't have the carry that Titan's did, whereby at the end of the album I was getting a bit bored. The novelty of this instrumental stoner/doom psychedelia had worn off, and I wanted something with a bit more depth. Normally I don't do a song by song breakdown of albums, mostly because it is tedious, but also because most albums don't deserve it. The Grand Astoria II is an exception, due to it's complexity and variance of sound. This unexpected shift in song style is great, while I expected a doom album (it's only five songs and it's forty-five minutes long, do the math), or something more akin to stoner/doom. Having an upbeat song or two (or three) really does bring some added flavor to the disc. It still has the stoner/doom elements, but also some straight-forward stoner rock, lots of instrumentals and some jazzy grooves. It does tend to wear on the listener by the end, this world of psychedelia-tinged instrumental music. A little less of that, and a little more rock/groove and we'd all be alright.